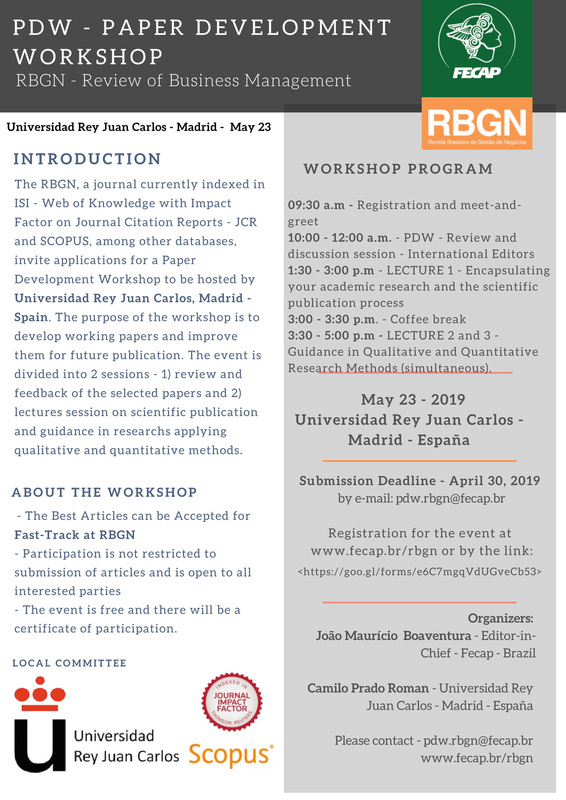 The RBGN - Review of Business Management, a journal currently indexed in ISI Web of Knowledge with Impact Factor - JCR, Scopus, among other databases, invite applications for a Paper Development Workshop (PDW) to be hosted by Universidad Rey Juan Calos, Madrid - Spain. May 23- 2019 - Universidad Rey Juan Carlos, Madrid, Spain. 3:30 - 5:00 p.m - LECTURE 2 and 3 - Guidance in Qualitative and Quantitative Research Methods (simultaneous).